1.Choose the kind of bit based on the material you will be drilling through. Steel bits are the least expensive and are generally OK for soft woods. From there bits range up to cobalt, for drilling through stainless steel and other hard metals. 2.Choose the bit type based on the purpose you will be using it for. 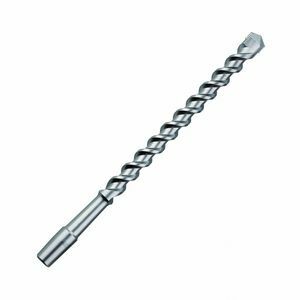 Regular twist bits are used for most general purpose drilling. A brad point bit can be used in wood for boring and is excellent at removing wood chips as it drills. The spade bit looks somewhat like a little shovel. Spade bits are used for boring large holes in wood, from 1/2" up. Refer to the Lowe's reference link below for more information on specialized bit varieties. 3.Refer to the drill manufacturer's instructions for specifics and limitations. Some drills work best with certain types of bit. There may be torque limitations on the drill that prevent specific bits from being used. 4.Slow and steady wins the race. Trying to drill too fast can result in the bit binding up and stopping. If this does occur, slowly back the bit out and start again at a slow, steady pace. Once you push through to the other side of the material, work the drill back and forth a few times through the hole to remove any rough spots. 5.For drilling through metal, use cutting oil to prevent the drill bit from overheating.